The Take Home Whitening System contains lower concentration of Hydrogen Peroxide which allows patients to stay in control of the shade of white they wish to achieve in the comfort of their own home. Our clinicians will take an impression of your teeth to produce a custom fit bleaching tray that fits perfectly to the shape of your teeth. This allows maximum contact to the bleaching agent to attain best results. Patients will notice whitening effects within two weeks of application. Teeth whitening is a non-invasive cosmetic procedure and is recommended for patients with good oral health. Not all candidates are suitable so call for a free professional consult today! 1. Why is my teeth turning yellow? 2. There are so many teeth whitening products on the market, which product is best for me? Teeth whitening products often contains Hydrogen Peroxide which causes the enamel structure to appear whiter. 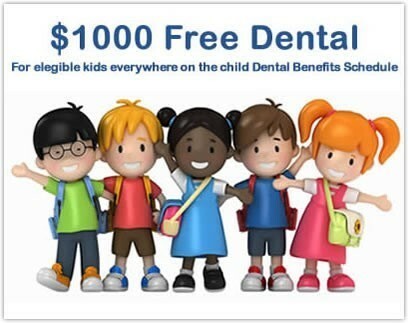 There are a few whitening toothpastes available in the supermarket which contain Hydrogen Peroxide, however at very low percentages which can take a very long time to have any whitening effects..
$1000 free dental for eligible children every two years under the Medicare Child Dental Benefits Schedule (CDBS). Treatments included in the CDBS are basic dental treatments such as check-ups, x-rays, fissure sealing, fillings, root canals, extractions and partial dentures. Other services, such as orthodontic treatment, cosmetic procedures and hospital services are not included. The total benefit entitlement is capped at $1000 per child over a two-year calendar period. The two-year cap period starts when a child or teenager first receives an eligible dental service. Please call one of our friendly staff to check your eligibility today or fill out our online eligibility form below and we will contact you. Special offer of No Gap payment or $90 for Children and $140 for Adults for patients with no dental cover. Start protecting your teeth today with a custom made mouth guard! 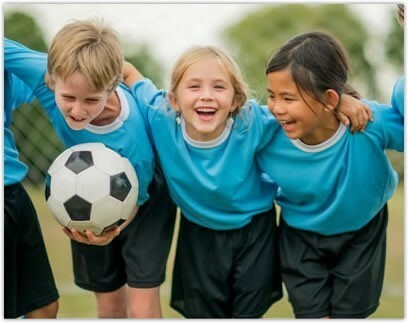 According to the Australian Dental Association (ADA), about one-third of traumatic injuries to teeth are sports-related. A custom-made mouth guard can protect your teeth by spreading the impact of any blow or knock to the mouth. At Riverside No Gap Dental our dentists recommends a mouth guard to be worn where there is a possibility of direct contact with the face. These includes sports such as football, soccer, netball or cricket. Even an accidental knock to the face or teeth with an elbow in a low contact sport can cause serious dental injury to your teeth or bone. Some injuries can cause lifetime dental expense and we want to help prevent this. Mouth guards made at Riverside No Gap Dental are custom-made and are of better quality than the shop bought products which are generally ill-fitting, bulky and hard to wear. Riverside No Gap Dental’s custom-made mouth guards are specially designed allowing you to bite, speak and breathe normally. How can I get a custom-made mouth guard? Our Dentists will take an impression of your teeth, jaw and soft tissue to fabricate your mouth guard to fit you personally. How often should I get a new mouth guard? Mouth guards for growing children should be checked regularly as baby teeth are lost, adult teeth erupt and jaw growth occurs. Ask your Dentist to check your child’s mouth guard at the “No Gap” 6 monthly check up. For adults, a well maintained mouth guard can last a long time. Our Dentists at Riverside No Gap Dental recommends mouth guards to be washed with cold water, kept in their original box and out of direct sunlight after every use. Routinely ask your dentist to check your mouth guard for defects or wear facets at your “No Gap” 6 monthly check up. Make an appointment today with one of our Dentists at Riverside No Gap Dental for a custom made mouth guard. To identify the type of staining present and the most effective treatment, a full check up and clean will be required to determine suitability of teeth whitening for you. If your health fund benefits cover you, this check up and clean will be at No Gap to you. Your Teeth Whitening Consultation will then be free and also covers your return consult to fit your custom made whitening model. Patients must be aware that teeth whitening will not be effective if anterior teeth are restored, crowned or had RCT. Patients who have active dental caries, periodontitis, severe gingival recession or sensitivity are not good candidates for teeth whitening. Some intrinsic stains may be better treated with microabrasion or veneering. Our teeth whitening is not offered to patients under 16 years of age and those aged 16-18 years require parental consent.